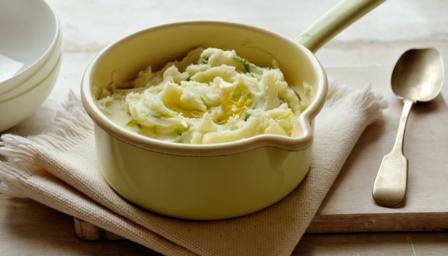 Looking for an easy mashed potato recipe? James Martin's creamy champ is perfect with sausages or pork chops. Boil the potatoes in salted water until soft. Drain and remove from the pan. Leave until just cool enough to peel. Mash thoroughly. Boil the milk and add to the potato, together with the spring onions. Pile into a serving dish. Make a well in the centre and add the butter. Serve immediately.